As the number of sites in conservation management along the Lake Wales Ridge has increased greatly since 1985, more scrub habitat has become accessible for Archbold research projects, and this has significantly expanded the geographic scope and relevancy of our research. With more acreage under management, a mounting number of land management challenges have emerged. Just like farmers and ranchers who traditionally turn to the agricultural research community to answer their questions, so conservation land managers have sought out Archbold to conduct research on how best to manage their scrub sites. Archbold Biological Station works extremely closely with many local, state, and federal government agencies and land managing agencies, as well as other not-for-profit organizations. Our close working partnership with The Nature Conservancy has carried the torch forward for Lake Wales Ridge scrub acquisition and management. Archbold staff conducts annual surveys of Florida Scrub Jays and implements our rare plant monitoring protocol called PDEP, for the 15 LWR Wildlife and Environmental Area units managed by the Florida Fish and Wildlife Conservation Commission. We have completed numerous biological surveys of other state lands such as the Lake Wales Ridge State Forest. Vegetation mapping, conservation planning, and rare plant research projects have been the focus for our support for the Lake Wales Ridge National Wildlife Refuge managed by the US Fish and Wildlife Service. Mark Deyrup and Jim Carrel are currently undertaking a Ridge-wide scrub endemic arthropod inventory over state and federal lands. Archbold also provides technical support for the local staff of many managing agencies, particularly for GPS and GIS spatial data, and with an emphasis on endangered species mapping and tracking prescribed burns. Archbold was a founding member in 1993, of the Lake Wales Ridge Ecosystem Working Group, an informal collaboration of 13 land management entities on the Lake Wales Ridge. 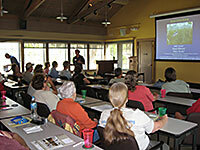 Many Station staff attends the Lake Wales Ridge Ecosystem Working Group meetings, usually 2-3 meetings annually, and frequently give presentations to participating land managers on subjects directly relevant to management of scrub. Archbold staff serves on several Lake Wales Ridge Ecosystem Working Group sub-committees that concentrate on issues such as fire management, exotics species control, and environmental education. This unique and enduring Lake Wales Ridge Ecosystem Working Group collaboration among land managers, scientists, conservation professionals and educators has served as an exchange crucible for information, ideas, progress, and resources among all the partners. The Lake Wales Ridge Ecosystem Working Group is lauded frequently state-wide as a model example of what can be achieved when regional partners bring different strengths to the table to their overall benefit. The other members of the Lake Wales Ridge Ecosystem Working Group look to Archbold Biological Station as their credible source of scientific research, data, and planning. Archbold benefits from Lake Wales Ridge Ecosystem Working Group participation by having our research-based land management recommendations implemented rapidly, by learning quickly about new land management challenges and what research might be needed to address them, and by having several land managers willing to help, and sometime fund us, to implement research projects on their own sites. Another important conservation partnership forged by Archbold Biological Station has been with the U.S. Department of Defense. Avon Park Air Force Range, 106,000 acres, lies about 45 miles north of Archbold, and encompasses scrub, pine flatwoods, dry prairie, marshes, seasonal wetlands and forested wetlands, as well as managed grazing lands and planted pine forests, lands, and the military infrastructure. Since 1991 Reed Bowman and the avian ecology program have conducted an expansive research and monitoring program for federally listed bird species at the Avon Park Air Force Range, including Florida Scrub Jay, Red-cockaded Woodpeckers, and Florida Grasshopper Sparrow, which has provided important insights into the biology of these species in a matrix of natural and managed landscapes, whilst providing critical data for informing Avon Park Air Force Range military operations. Recently Betsie Rothermel in the Herpetology Program has added new studies of Gopher Tortoises at the Avon Park Air Force Range to Archbold research and monitoring activities in support of DOD operations.